The Interior Department has responded to requests from the House to provide more detail about acting Secretary David Bernhardt's schedules, just days before he testifies in his Senate confirmation hearing to become the secretary permanently. In response to a request from the House Natural Resources Committee the department said on Monday afternoon that it had sent almost 7,000 pages of documents related to Bernhardt's meetings and daily schedules. On Tuesday, Interior said they actually sent almost 27,000 pages of documents. In a previous letter, Bernhardt declined to provide any documents, saying "I have not personally maintained a calendar for years, and I have no intention of suddenly doing so now." The department posts a public version of Bernhardt's schedule on its website every week, but it only includes details of external meetings. Rep. Raul Grijalva, D-N.M., chairman of the House Natural Resources Committee, said Congress has a right to know more about what Bernhardt and other officials are doing at Interior. The details of his schedule have been under scrutiny as Democrats on the Hill and advocacy groups seek to determine if Bernhardt has violated any ethics recusals by meeting with or working to benefit groups he has lobbied or worked for before being appointed to Interior in 2017. Oversight Chairman Elijah Cummings questioned a department official on whether Bernhardt's calendars were being deleted in a hearing on the department's records policies earlier this month. Bernhardt previously worked as a lawyer and lobbyist for multiple groups that could benefit from decisions made by the Interior Department. Under President Donald Trump's ethics pledge and federal ethics laws, he is recused from working on issues that specifically relate to his former clients but Grijalva said industry has made "massive inroads" through the leadership at Interior and he's concerned about a pattern of decisions that seem to benefit energy companies and other groups. "Mr. Bernhardt is a former lobbyist for multiple industries, oil, gas and those companies fortunes, they rise and fall with decisions that are made at Interior. So as somebody who wants to lead this agency, he has a responsibility to provide all the documents that are being asked," Grijalva told ABC News. Interior's response included thousands of pages of Bernhardt's calendar, including forms submitted by outside entities meeting with Bernhardt, descriptions of daily meetings and a daily schedule compiled by staff and included in a briefing book each night. "I think disclosure -- full transparency -- that can alleviate a lot of concerns. But until we have that kind of transparency, I'm not solely working on speculation and conspiracy theories, I'm working on a pattern and the pattern is pretty powerful," he said. As of Monday night the committee did not confirm that the documents were received. A memo obtained by ABC News also shows that ethics officers at the Interior Department cleared Bernhardt from allegations he violated conflict of interest rules by getting involved in a decision that would change how water is managed in California. He previously represented a client involved in the issue in a lawsuit against the federal government. 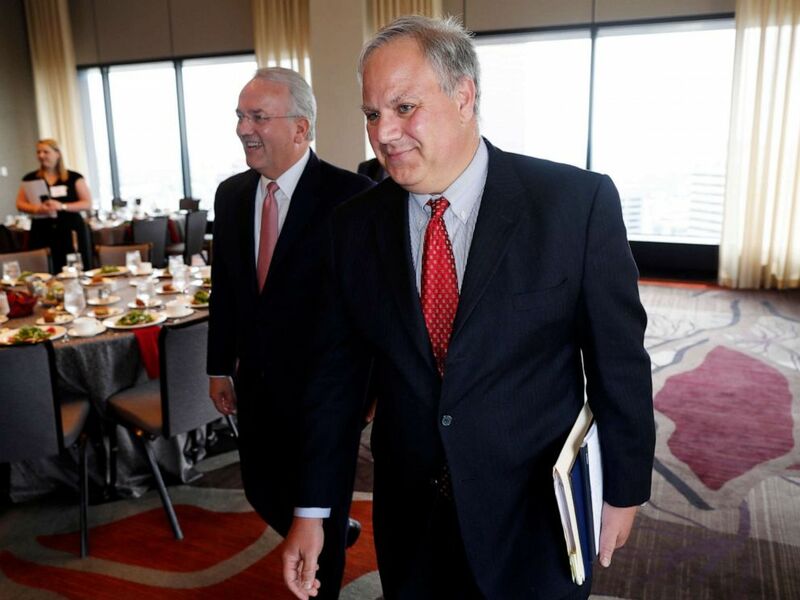 Deputy Secretary of the Interior David Bernhardt heads up to speak during the annual state of Colorado energy luncheon sponsored by the Colorado Petroleum council in Denver, July 26, 2018. Conservation groups and Democrats have accused Bernhardt of working to the benefit of his former clients -- many of which are industry groups or energy companies -- because he has pushed to expand access to sportsmen and for energy production on federal land. He was recused from working on issues that directly relate to more than 20 former clients. Bernhardt was confirmed as deputy secretary in July 2017 and has been leading the department in an acting role since former Secretary Ryan Zinke resigned last year. In February, Bernhardt confirmed to The New York Times that he directed department officials to begin reviewing how California manages water, a decision that would divert more water to farmers and cities, possibly at the expense of endangered populations of fish. The news led to allegations that he violated ethics recusals because he previously represented the Westlands Water District, which has sued the federal government saying more water should be diverted to farmers and cities. In a memo and email from the department's ethics office, obtained by ABC News and dated a few days after the Times story came out, ethics officers found Bernhardt wasn't required to recuse himself from the entire California water project because it didn't only apply to his former client. In a memo the agency's designated ethics official said the decision to draft a new environmental impact statement and propose changes to the water management project were "broad policy options" that impact a "large and diverse group of persons." Lawyers from Interior's ethics office determined that the department's decisions to re-evaluate the Central Valley Project, a federal effort to divert water to areas of California affected by drought, was more general and Bernhardt wasn't required to recuse himself because it didn't only impact that specific client. Bernhardt was questioned about his involvement in the California water district when he was nominated to become deputy secretary in 2017. “I will follow all of the recusals I have and on top of that, if I get a whiff of something coming my way that involves a client or a former client or my firm, I'm going to make that item run straight to the Ethics Office. And when it gets there, they'll make whatever decisions they're going to make and that will be it for me,” he testified at the time.